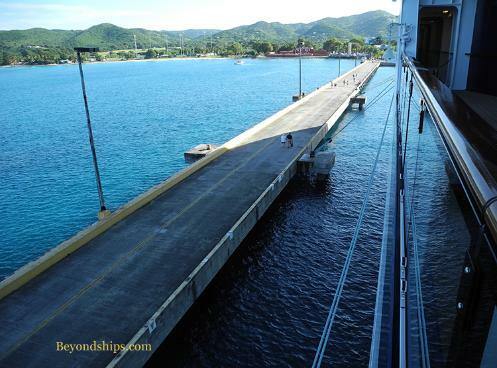 Celebrity Silhouette at the Ann E. Abramson pier in St. Croix. Cruise ships carrying more than 200 passengers that call in St. Croix dock in Frederiksted. The Ann E. Abramson Marine Facility is a 1,526 foot peir capable of handling two large cruise ships at a time. (It can also handle two "mini-cruise ships"). The draft on the north side is 29 feet and the draft on the south side is 36 feet. The pier is big enough that shore excursion buses are able to drive up to the ships in order to pick-up and discharge passengers. Although St. Croix still receives much fewer ships than St. Thomas, a major renovation project in Frederiksted and incentives offered by the Virgin Island Port Authority have attracted a growing number of ships to the island. Above top: The Anne E. Abramson Pier extends a considerable distance. Above bottom: A tram brings passengers from their ship to the small terminal building on the Anne Abramson Pier. 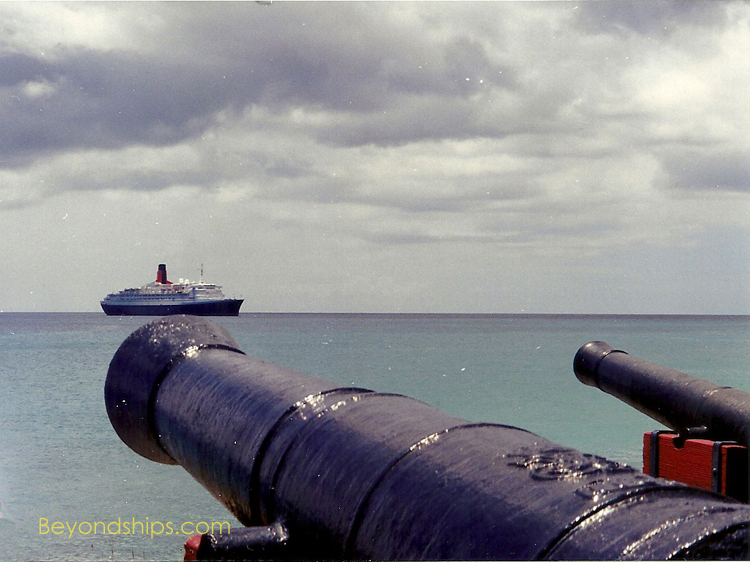 Right: Queen Elizabeth 2 tendering off of Frederiksted. 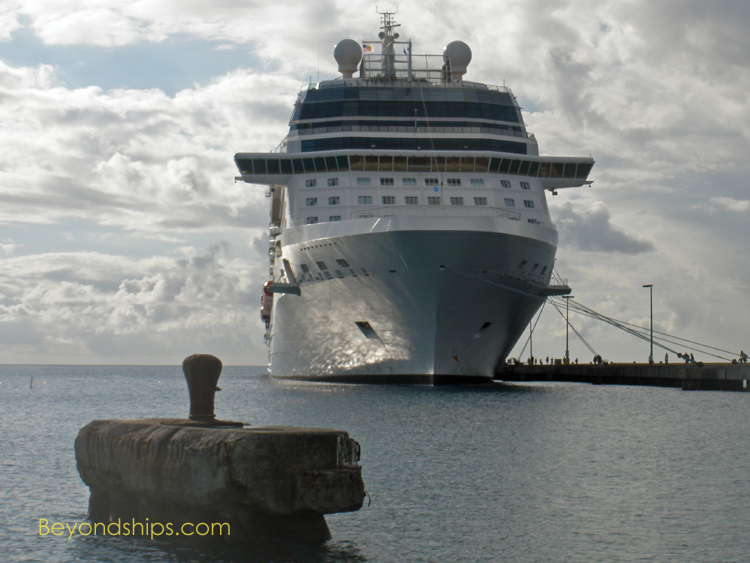 The cruise ship pier in St. Croix is in the heart of the town of Frederiksted. 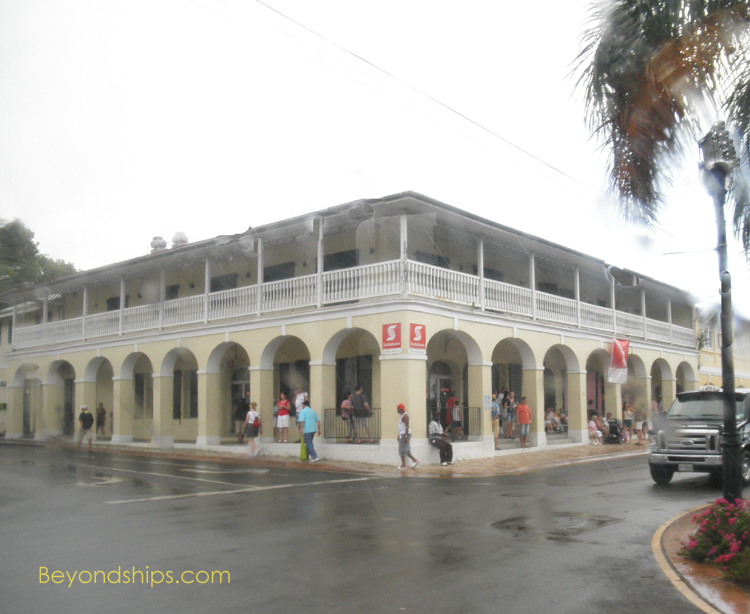 Its historic buildings, including Fort Frederik, the shops, and even a beach are within a short walk from the pier. Most passengers going further afield who are not on one of the ship's shore excursions use taxis. Taxi rates are based on destination rather than mileage and regulated by the US Virgin Islands Taxi Commission. Drivers often gather at the end of the cruise ship pier looking for business when a cruise ship is in port. There is also a taxi stand in Christiansted on King Street. The island also has a bus service called Virgin Islands Transit or VITRAN, which is operated by Department of Public Works. 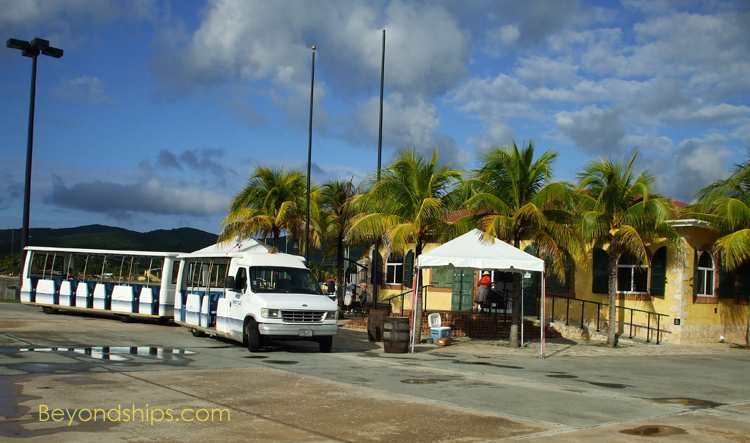 In addition, St. Croix has "taxi buses," which are in essence, vans and cars that are shared by several passengers. Locals stand by the side of the road and flag down these vehicles. For a flat fee, a passenger can travel to any place along the taxi bus' route. Cars can be rented at various locations in St. Croix. But keep in mind that drivers in St. Croix drive on the left hand side of the road as they do in Great Britain. Almost all the cars in St. Croix, however, were built for American-style driving and so the steering wheel is on the opposite side of where it would be on a British car. SHOPPING St.Croix is not known as a major shopping destination like sister island St. Thomas. However, the island does have unique local shops that shoppers may find interesting. Crafts and artwork produced by local artists are popular items as are jewelry and rum (which is distilled on the island). In Christiansted the primary shopping area is along King Street and Company Street. In the arcades of some of the old Danish buildings are warehouses that have now been converted into shops and studios. 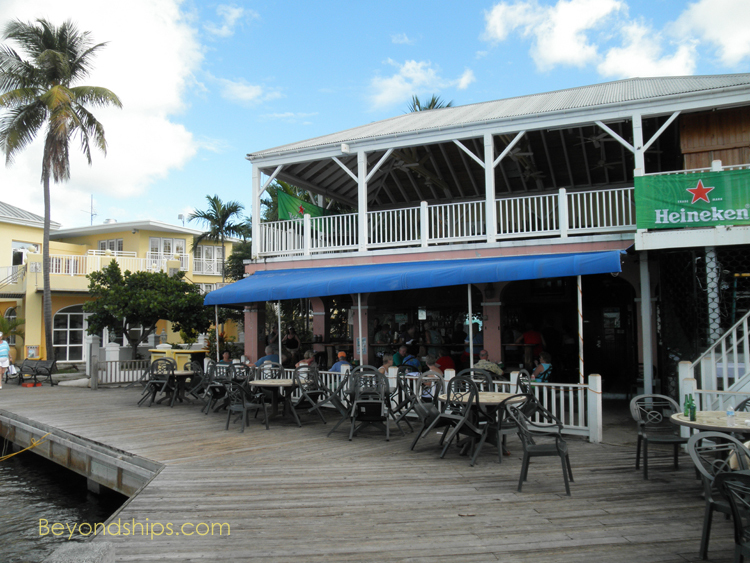 In Frederiksted, Strand Street, which parallels the waterfront, offers shopping and restaurants. In addition, local entrepaneurs often gather by the cruise pier when a ship is in port. There are no customs duties on most merchandise, and there are no local luxury or sales taxes. U.S. citizens, including children, can shop in St. Croix and return to the mainland with up to $1,600.00 worth of duty-free merchandise every 30 days. The currency on the island is the U.S. dollar. Major credit cards are widely accepted. In general prices in the shops are fixed. However, some local vendors will bargain. 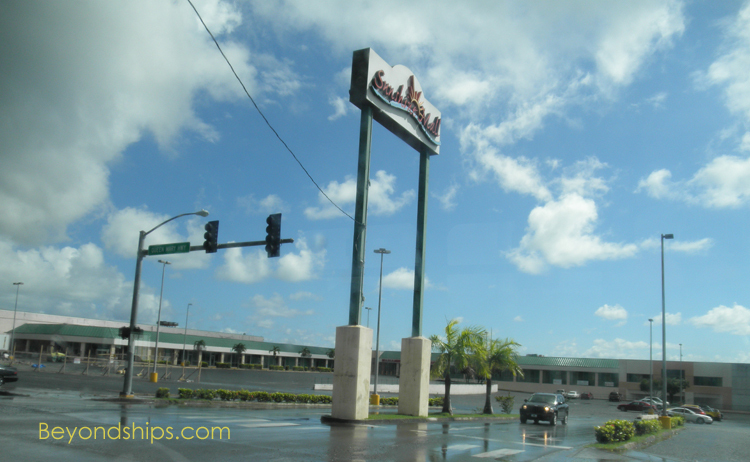 Left: St. Croix is part of the United States and it has malls and major chain stores like those found elsewhere in the United States.